The Tidy Books Kid’s Bookcase was created by a mom to encourage children’s love of books and get them reading. Her design was the first front-facing bookshelf for the home, and it forever changed the concept of what a good kid’s bookshelf should do. - Slimline space-saving storage solution. - This book shelf gives books a special place in your home. - Safely attaches to the wall, can’t be toppled. - Sturdy lime wood will not bend under the weight of books. - Back panels mean books can’t slip behind the bookcase. - Award winner: Loved by Parents, Right Start, Junior Design. - Finished in safe, eco-friendly water lacquer (low VOCs). We could have coated them with a solvent based acrylic, but we made an ethical choice. Water lacquer shows the natural imperfections in the wood, and is better for the planet and your kids. - Tidy Books, a small company, makes kid’s storage designed by founder and mom Geraldine to foster kids’ independence, and supports kids’ reading charities. The Tidy Books Kid’s Bookcase is an ideal kid’s library to be treasured for years. Order yours here! 3D ALPHABET in lowercase letters encourages letter recognition and gets your child ready for learning. 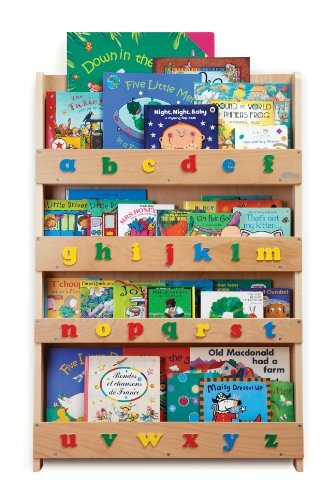 STORES UP TO 85 PICTURE AND BOARD BOOKS in slimline, space-saving book shelves. HANDMADE FINISH, SAFE AND ECO-FRIENDLY. Sustainable Wood. No MDF. Water lacquer finish. STYLISH, ORIGINAL DESIGN makes an ideal first library for your child. If you have any questions about this product by Tidy Books, contact us by completing and submitting the form below. If you are looking for a specif part number, please include it with your message.